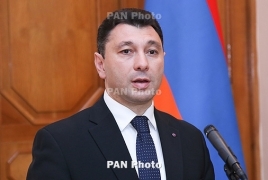 PanARMENIAN.Net - Deputy President of the Armenian National Assembly Eduard Sharmazanov, lawmaker Tachat Vardapetyan and representatives of ethnic minorities on Saturday, May 19 visited the Armenian Genocide memorial in Yerevan to honor the memory of the victims of the Greek genocide. In a conversation with reporters, Sharmazanov reminded that the Armenian parliament unanimously recognized the genocide of Greeks back in 2015. “It's a great honor for me to be the key rapporteur on the issue,” lawmaker said. According to him, the Greek, Assyrian and Armenian Diaspora and the three countries together can resist the Turkish denialism. Sharmazanov, who is of Greek descent, said April 24 and May 19 are first and foremost days of revival. “As I have said before, I am 100% Greek and 100% Armenian, and that gives me more strength to fight for the international recognition of both the Armenian and Greek genocides,” the MP said.